Since their introduction almost 30 years ago, conductive rubber switches and keypads have gained enormous popularity and acceptance because of their reliability, long operational life and excellent tactile feel. These keypads are very cost effective in high volumes. Conductive rubber switches and keypads were originally developed for the electronics industry to meet the increasing demand for inexpensive momentary contact switches. Conductive rubber keypads became desirable because they look and feel like traditional push-button style switches, but do not have their inherent disadvantages. Silicone rubber keypads are such an integral part of so many electronic devices that we tend to take them for granted. It is easy to make the mistake that keypads are just a commodity. But in fact, a well-designed and manufactured keypad can contribute as significantly to a product's success as a poor keypad can to its failure. The choice of a variety of different surface treatments for maximum abrasion and chemical resistance. Call us to request samples, and discover for yourself that all keypads are not created equal. 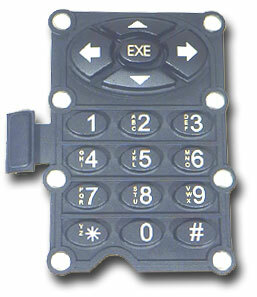 Click on the Speed Quote link on the left to request a quote for a rubber keypad.